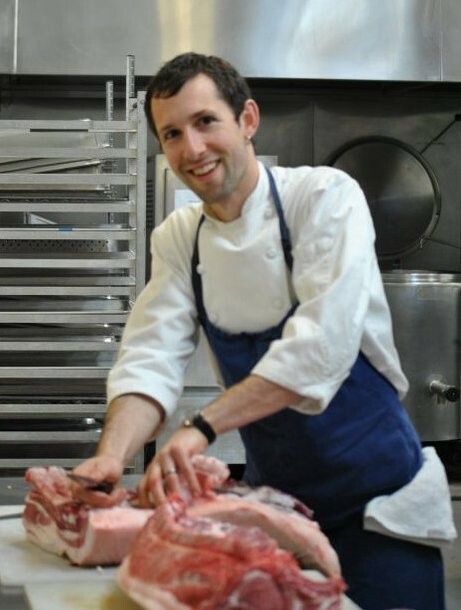 Berkeley is slated to get an artisan butcher shop later this year, one that’ll trot out a variety of sustainably raised whole beasts. The Local Butcher Shop hopes to launch in early September, in the old Red Hanger Kleaners at 1600 Shattuck, on the Cedar Street side of the complex, just behind Crepevine, and staring smack into the parking lot of Andronico’s. The proprietors: current Chez Panisse cook and Oliveto alum Aaron Rocchino and his wife, Monica, an account exec at Emeryville’s Paula LeDuc Fine Catering. The Rocchinos acquired the 1,100-square-foot North Berkeley space last fall, and spent months lining up permits. The buildout began early last week, but don’t expect the Local to look like butcher shops you’ve known. Instead of the traditional cooler case showing off chops and trimmed loins, the Rocchinos plan to display larger cuts from whole animals, and cut all meats to order. Pork, beef, lamb, chickens, ducks, rabbit, eggs — all animals will come from ranches and farms within 150 miles of Berkeley (Ingel-Haven Ranch in Potter Valley, Wolfe Ranch in Vacaville, Devil's Gulch Ranch in Nicasio), raised in what Rocchino called “an iconic sustainable way,” pasture raised, grass-fed in the case of grazing animals. The quality (and prices) should be akin to that at Marin Sun Farms' counter in Rockridge and the Café Rouge market on Fourth Street, but with the interactive and educational focus of San Francisco shops like Avedano’s and Fatted Calf. Other Local offerings: house-made stocks, demi-glace, and rendered fats, plus a daily sandwich. As for giving the meat counter at Andronico's a bit of unprecedented competition at a time the chain is struggling, well, uh — sorry, guys. "Thus far the neighborhood has been really welcoming," Rocchino said, "but so far we’ve been super undercover." Then again, will the boutiquey-ness of the Local's meats make them affordable only to Berkeley hill dwellers? Not necessarily. Monica Rocchino: “Because we’ll be buying whole animals, we’re paying one price — it’s the distributors who put an arbitrary value on cuts. We don’t want to be so expensive that nobody can afford to shop here.” Plans call for highlighting less familiar (read: cheaper) cuts, offered with recipes from Aaron Rocchino that should ease customers’ journeys into the unknown. “He’s a damn fine cook,” his wife said.